For the past two decades, Jayson and Nikita have been the closest of friends, enduring many long years in captivity by finding peace and comfort in one another's company. 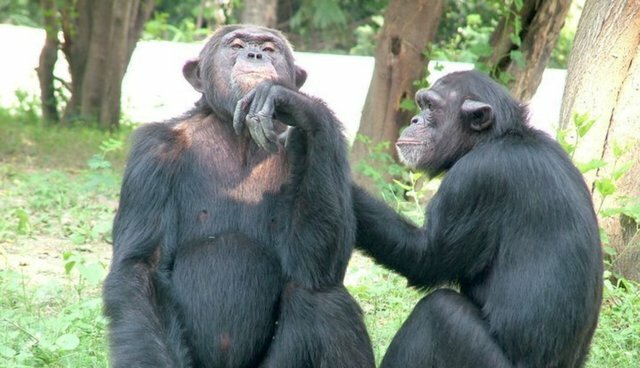 Since the chimpanzees were born and sent to be on display at a zoo in India, they've never been apart - living together as one of the only animals like themselves they have ever known. "They are one of the most compatible and beautiful animal couples I have seen in my 30-year career," the chimps' keeper, Surendra Singh, told the Times of India. But their happy union will soon be coming to an end needlessly - and animal advocates fear the resulting heartbreak could prove deadly. Officials at the Lucknow Zoo, in the city of Uttar Pradesh, said they plan to separate Jayson and Nikita simply because the lifelong friends have not produced an offspring. If all goes according to plan, Nakita will be transferred to another Indian zoo within the month in hopes that she'll mate with a male chimp there, leaving Jayson without companionship for the first time in his life. As highly social animals, chimpanzees form deep and lasting bonds, the sudden rending of which by death - or in this case, forced separation - can be felt as nothing short of devastating. Far from being unfeeling animals, chimpanzees have demonstrated a remarkable depth of emotion, responding to the loss of loved ones much in the same way that humans do. "Grieving and mourning clearly show that nonhuman animals are socially aware of what is happening in their worlds and that they feel deep emotions when family and friends die," writes evolutionary biologist, Marc Bekoff, in Psychology Today. "Clearly we're not the only animals who possess the cognitive and emotional capacities for suffering the loss of others." Chimpanzees who have lost a companion have been known to suffer from symptoms of depression - and, as Bekoff notes, in at least one case resulted in what appeared to be death by broken heart. "Since chimps are intelligent and sensitive like humans, a permanent separation will give them trauma. Besides, depression can be fatal for the pair." Animal welfare activists are hoping that the zoo will reconsider separating the bonded chimpanzees, suggesting that another male be introduced on a limited basis at the Lucknow Zoo instead. But the transfer of animals away from their companions and familiar environs is par for the course for zoos aiming to breed their captives, even if it comes at the expense of their well-being. Despite the similarities humans share with other primates commonly held in captivity, zoos are under no obligation to put the feelings of animals ahead of a business agenda. But how these animals are regarded in society could soon change. Advocacy groups, like the Nonhuman Rights Project in the U.S., are fighting for primates to be granted "personhood" status in the eyes of the law. Slowly but surely, the winds of change are gaining momentum, until perhaps one day no more lifelong friends will be needlessly parted.